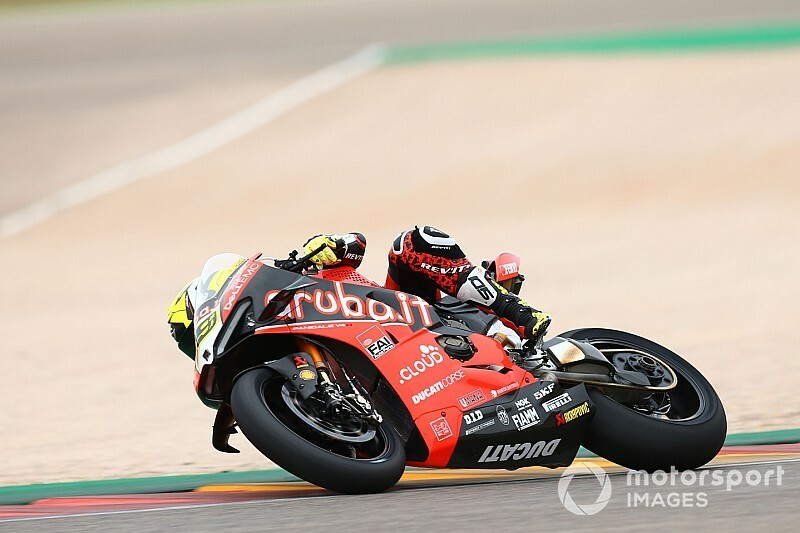 Ducati rider Alvaro Bautista made it seven World Superbike wins in seven starts as he converted pole into victory in the opening race at Aragon. 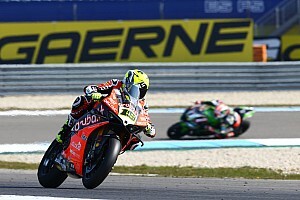 Bautista needed a little over a lap to shake off his pursuers, and paced himself towards victory as a frantic pack race unfolded behind him in the fight to be best of the rest. Keeping the lead off the line, Bautista had to fend off the BMW of Tom Sykes through the first three sectors. But the BMW, which lacks straightline speed, was then swallowed up by Alex Lowes and his Yamaha, which allowed Bautista to lead by six tenths over the line. This turned into two seconds after the second lap, and his lead grew gradually from there, aided by a heated battle between Jonathan Rea and Chaz Davies – who combined for every win in each of the previous eight Aragon Superbike races. Rea, who started 10th, was up to sixth after the start despite what looked like a handlebar clash with Markus Reiterberger, which led to a big crash for the BMW rider. But Rea was soon re-passed by Davies before getting back ahead of the Welshman with an audacious move at Turn 3, for what was now fourth place. On the fourth lap, Rea picked off Sykes on the back straight and was handed second place when Lowes ran wide entering Turn 16. This allowed Davies to follow Rea, and the Ducati man lunged at his rival at that same corner on the next lap, running wide but getting a better exit onto the main straight. Over the next few tours, as Bautista continued to check out up ahead, Rea and Davies went at it for second place, trading numerous overtakes, before Rea finally made a move stick at around the halfway point into the 18-lap race. At that point, however, Lowes came into his own, storming past Davies and moving ahead of Rea on lap 12, only for the reigning champion to respond into Turn 16. 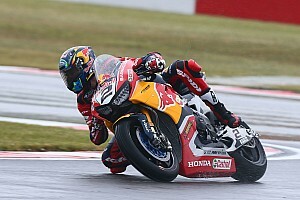 But Lowes eased past Rea on the back straight on the following tour, and Davies – who had only just fought off a spirited attack from Lowes' teammate Michael van der Mark – then overtook the Northern Irishman at the Turn 5 left-hander. He then reeled in Lowes, outdragging the Yamaha on the back straight to assume second place once more. Rea, however, still had something up his sleeve, first demoting Lowes off the podium and then catching Davies to pass him at Turn 4 on the penultimate lap. 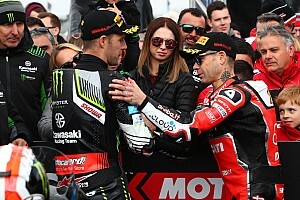 As Bautista took the chequered flag ahead – winning by 15.170s, his biggest winning margin yet in the series – Rea held on to his seventh consecutive runner-up finish. After a Turn 1 lunge on Rea didn't come off, Davies had to battle the resurgent privateer Ducati of Eugene Laverty on the final lap. The GoEleven rider ended up too close to Davies as he clipped the back of the works Ducati through Turn 14, running wide and falling off-track. This ensured Davies' third place and his first podium with the Panigale V4 R, with Lowes and Sykes making up the top five. Van der Mark led front-row starter Sandro Cortese in sixth, while Puccetti's Toprak Razgatlioglu beat the fellow Kawasakis of factory rider Leon Haslam and Pedercini man Jordi Torres to eighth. Marco Melandri, who hadn't finished lower than sixth in the first six races, was only 12th, outfoxed by the top Honda of Leon Camier. Leandro Mercado and Alessandro Delbianco joined Reiterberger in the list of retirements, crashing early at Turn 12.